In this article I’m going to focus on the foods that you’ll particularly want to avoid when having In Vitro Fertilisation (IVF) treatment. Whilst I have a general article on nutrition when trying to get pregnant (Pregnancy Nutrition Advice), there are some details worthy of note for moms having fertility treatments. Many women incorrectly think that In Vitro Fertilisation is the answer to everything and they can relax about what they eat and drink. This can prove to be a very expensive and heart-breaking mistake. You need to seriously think about IVF nutrition, as the wrong type of food can actually hold back development of the follicle and damage the implantation of the embryo. Whilst nobody is saying you need to go on a strict diet during IVF, you need to be aware that being overweight, or having excess body fat, is going to make pregnancy and conception more difficult. A lot of what I’m about to expose is actually common sense. This should apply to you whether you are just trying to get pregnant in the traditional manner; are under-going fertility treatments; or even if you are not trying for a baby at all !!! 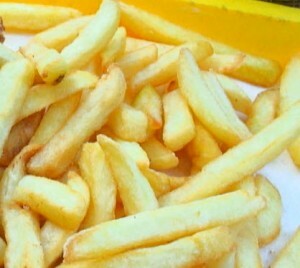 Trans fats are found in fried food. Think of chips and fast foods and you will know what I mean. If you want to become overweight, then this is the fast-track. But also be wary of the hidden trans fatty foods that could also be a danger to your IVF treatment. Partially hydrogenated vegetable oils are a common culprit. Studies have shown that women who do eat this type of food are less fertile (Nurses Health Study). In fact, 73 % of women are likely to be affected, given just a 2 % rise in trans fatty consumption. It also affects men as well – so don’t neglect your diet either guys. This is another product that affects both female and male fertility. Human Reproduction revealed that half of the men monitored in a survey, who had high soy consumption, had poor quality and lower sperm count. Okay, so it will be very difficult to cut sugars and refined carbohydrates out of your diet completely. But you need to understand that they do not help your IVF treatment. This is particularly true if you are having IVF due to polycystic ovarian syndrome (PCOS). Eventually, your body could become resistant to insulin. 70% of women with PCOS are insulin-resistant, studies have shown. Normal foods, it should be said, release glucose in a more controlled (slower) fashion. This should be the aim for any mom trying to get pregnant, but particularly those going through IVF treatment. Researchers have found that Hyperstimulation in the IVF cycle can be caused by a high carbohydrate diet. Of course, if you are in any doubt at all regarding your diet when under-going IVF treatment then you should speak to your health practitioner, fertility doctor, or nutritionist. 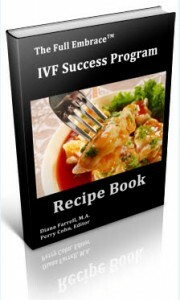 Looking for Free IVF Recipes ? Okay, I’ve told you what you shouldn’t be eating, but what can you eat as part of your IVF diet plan ? Fertility expert Diana Carroll had produced an excellent course on IVF called The Full Embrace™ IVF Success Program. This is a must have for any woman who is going through, or contemplating IVF treatment. As part of that course, Diana provides a separate free bonus book specifically about healthy IVF diet planning. This shows how you can actually repair the damage you might have done with your diet and its effects on your fertility. If you would like to see my in-depth review of the full IVF Success Program, then click here : IVF Success Program review. Author : Maria Anderson is a researcher of women’s health issues. This article has been produced for informational purposes only and should not be seen as a substitute for professional medical advice. If you liked this article then please share using the social media buttons below.